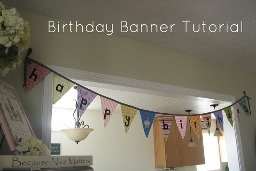 Chris from Pickup Some Creativity shares a tutorial on her blog showing how to make this fabric Happy Birthday banner. Make one and create a new family birthday tradition! Go to the tutorial. Just a quick Thank You for posting this tutorial and the templates I am making this now for my daughter’s birthday and the fact that I have everything – especially the lettering, is so nice!!!! Really appreciate the time you took to share this!